Synopsis: A look at musician Nick Cave's creative process while he ramps up a performance at the Sydney Opera House. The creative process is an enigmatic concept. How an idea can turn into a painting, a song, or even a movie is one of the best things in human existence. While most music documentaries seem to take more of a direct personal approach, directors Iain Forsyth and Jane Pollard try to understand the philosophy of Nick Cave both as a person and as an artist. For those that aren't familiar, Nick Cave is an amazing musician who's had a long and rich career. Apart from his work with the Birthday Party, the Bad Seeds, and his solo career, he has written screenplays (including a rejected GLADIATOR sequel), books, and movie scores. He's collaborated with so many people from The Flaming Lips, PJ Harvey, and Kylie Minouge. Needless to say, Nick Cave is a prolific artist, and it shines through in this movie. To start off, this is a beautifully shot documentary. Instead of just letting the camera sit there filming, there's some dynamic shots especially when there's a concert or when Nick goes to someone's house. The camera constantly shifts focus to seemingly innocuous items, but it adds a visual flair that can be missing from documentaries. The directors do a particularly good job on filming the musical performances with special note to the last performance which is cut with old performance footage of Nick Cave's career, curiously showing how his stage persona and prescence has both evolved and stayed in the same energetic and chaotic style. The highlight of the movie is Nick Cave himself. Just hearing him talk is a treat. The movie has a "storyline" in that its focus is on exploring the creative process and intercuts with interviews with collaborators. Seeing his songwriting process from a small idea leading up to a climactic performance at the Sydney Opera House is a site to see. As a writer and a singer, he's a very articulated interview subject. He recalls everything from his early days in music, to meeting his wife and just waxes poetic about creating art. A couple of highlights are two segments where he talks about his fear of losing his memory, and how memories define us as individuals. Then he later goes on to talk about bad ideas, and how doing something even if it's bad will always be better than not doing anything at all because of our limited time here. 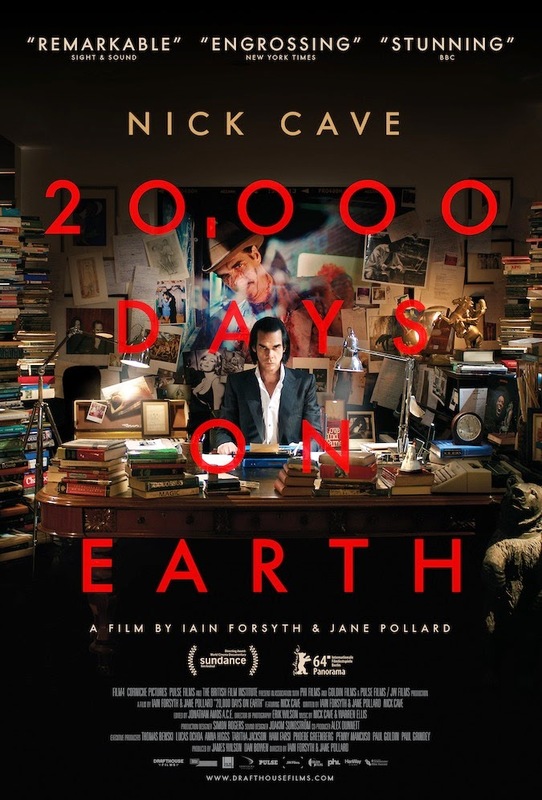 20,000 DAYS ON EARTH is a wonderful treat for long-time Nick Cave fans and while it's easier to appreciate if you're familiar with the man, this is also something that can be enjoyed by everyone. It's well shot, there's great music, and the subject just happens to be one of the best creative forces out there. 20,000 DAYS ON EARTH is available now on VOD and select theaters.